This is a discussion on When to Slow Play in Poker within the online poker forums, in the Learning Poker section; Slow playing in poker is another one of the many tools you will want to have in your arsenal to be a successful poker player. Slow playing in poker is another one of the many tools you will want to have in your arsenal to be a successful poker player. A good player knows when to slow play, and when not to. As with most things in poker, there is never a cut and dry scenario for any given situation. That is why it is important to recognize some different factors that will help you to decide on the best move, and whether or not you should slow play. What did you learn that stuck out to you the most? Do you have any other tips to share on slow-playing? I slow play TPGK Or TPTK on a dry board or quads or FH's...anything else I bet because they either got something or do not. Unless they are signifgcantly aggro then I go for the turn check raise. It's easy to throw chips around,,,even easier to hold your chips so hard your hands bleed. Being aggressive is key,yes,,but you'll never reach the next level,without this in you're arsenal of plays in your game. Most people/players are ticked when another slow plays , well like the article says , sometimes you have to ! AA is one hand that should be - for me it is . Everytime I decide to raise preflop sure as shootin , someone beats me with a really crappy hand ! Like 2 small prs ... so yes slow play is a smart strategy sometimes. Then you need to read the article. Sometimes it's the smart play. Good article! I do not use the slow game when several people participate in the game. Because there is a high risk to give opponents a chance to improve their hands and lose winnings! And I try to use the slow game when I have a very strong combination! I play slowly with a very strong hand. There is always a risk that in the end your opponent will raise his hand better. Slow drawing a good hand, such as pocket aces? ... Hmmmm. Sometimes it makes sense, but depends on the composition of the players at the tables, and their opinions about the style of your game. 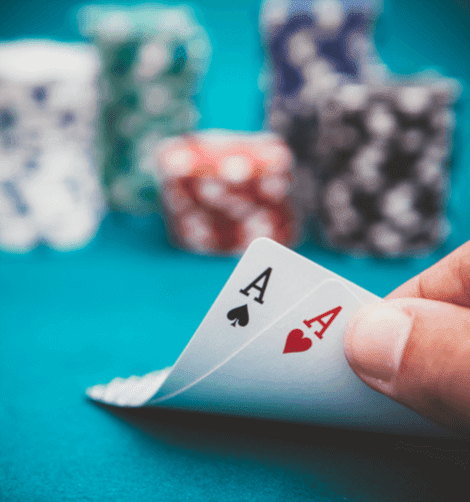 If you usually have a solid playing style, raising only a very narrow part of the range of hands, then your preflop raise or push with AA will most likely steal the blind. Few would want to ring a raise from the silent "rock." It turns out that your premium hand, which is not so often at your disposal, practically does not bring you profit. This is especially noticeable in the tournament game, where you can not just be satisfied with a pair of blind, and should provoke your opponents on a full stack. Yes, of course there is a risk that the villains will cheaply call with a weak hand and get a stronger combination. But there are also good chances that the villain will receive one pair and will call with her before the river. Such a game has a certain risk, but sometimes it is the only sure draw of a strong hand. Thank you very much for another excellent strategy article, this helps us to improve our game on. I think when you have a very strong hand on the flop, and the flop is very dry, I think you can make check and give a letter, and hope that the villain connect something to catch him. I usually slow play monster hands like hands that is higer than 10s. Or suited hands like AK, AQ etc. Any experienced player knows that behind a slow play there is an unbeatable hand. Therefore, it is important to identify the opponents profile, the selection of the best hands and the ability to convert your game into something more lucrative and less aggressive. it is always difficult to know how to move at the right time. Thank you for this article that will help me manage my game better. slow play is key to get someone bluffing and giving you a lot of chips thinking they have the better hand or just thinking they can bluff you since you have nothing. I think the most important thing about slow play is knowing that you have the best hand and that whatever comes out you will still remain the top hand. However that is easy level of slow play sometimes you have to do it trusting that the better hand is not going to come. I think something key in slowplay is betting hard before flop to get a valuable pot and slow playing after. The best time to apply a slow play is when your opponent has a very aggressive style of play and his word is your first. There is nothing more pleasant in poker when you are lucky enough to catch a set on the flop, and your aggressive opponent himself is the first on every street to bet. So he "feeds your monster." This is probably the only case when I use Slow Play. I accept an aggressive player to flop and then re-raise on the turn. And if the opponent has at least the highest pair, then in most cases he becomes tied to the bank, since he has already invested a lot of money in it. And only then I go all-in on the river. The turn is the right time to tie someone to the bank. If your opponent attacks the bank on the turn, simply double or triple his bet, and in most cases, he will go to the end on the river. I slow play strong flopped hands on any type of board vs a very aggressive opponent. Slow playing dry boards with a strong top pair vs a tight player can win you extra money especially if your opponent doesn’t float and folds to c-bet when they miss the flop. Slow playing also works well on boards where you flop so much of the board that it makes it very hard for your opponent to continue. I guess, I do not slowplay so much. Especially not on preflop, when I have a good hand. But this is just for tourneys. Post-flop it is different, I would say. Maybe it is good to "wait" until your oponent makes the mistake. But in short games, I mean hyper games or especially spin and go's it can make sense to slow play and trap your opponent somehow, when you have a read on him, like that he is willing to raise or push, when you are limping in. For myself a slam dunk slow play is against aggressive villian, for example we have aj+ ep. These textures with our range v loose aggressive. I'm almost always slow play. maybe it's not right, but that's my style of play. article of course useful, I learned several new details, which will apply in further. Thanks. Slowplaying has it's place in poker, but it should be used in selective and proper situations. There isn't a general fixed rule about when to slowplay. It depends on the situations. I would say that I can slowplay top sets on dry boards or anything from quads+. But again this isn't 100% fixed. Sometimes I will do my normal continuation bets. Every strategy one day can be usefull. I like to slowplay with showdown value or with a super strong hand like aproximated to the nut against over agressive players, 2 pairs or third of a kind, I like lauch big bombs and reanalizing after each street. A very good article that draws attention to very important points - what is the structure of the board, to whom it is more suitable - the aggressor or the volume who made the call. But I would also add to the article that you need to pay attention to which player we are playing - passive or aggressive. This also greatly influences the decision about how best to play your strong and weak hands. I think it's a bit dangerous move. Because your strong hand can become weak on the next street and because you are winning you may have lost a lot of chips. I usually play according to the villain, I modify my game every time to attract more lucrative actions. And as already mentioned, against good or regular players, slowplay is synonymous with a very strong hand. So it's hard to get the most out of these players with that kind of play. Good strategy sometimes, but, not always. Don't be consistent with it though. Be aggressive sometimes with a good hand. Nice one, I will include those tips in my game arsenal. I feel like this article was a little more ''advanced'' because we need to take into account the board texture the preflop action and the opponent( how aggressive / passive he is). Everyone says to bet sets on the flop but occasionally I won't and then bet on the turn and throw out a massive bomb on the river to polarize my hand and it usually gets called live, haven't really tried that online but I don't play much online. When flop a set, I bet the flop strong, and then check the turn no matter what, then probably a check-raise on the river. Slowplay sure is difficult. I have been sitting on quads waiting for someone to bet and the never do. I have had a massive multi-way pots. I have also had people catch up on the river. I slowplay a lot less than I have in the past. I definitely give it a lot more thought about who I am facing off against when I do it. Good article, thanks CardsChat. I love to slow play but you have to be very careful not to let someone catch a hand. I agree slow playing on a wet flop can be dangerous. It gives the person a chance to hit his hand. He hits a full house to your straight or flush. Chances are they are playing those cards so they will be in. I think you should add on wet flop the probability of getting a card with a wet flop. See you just hit a hand and the flop was dry. Its a good idea to go all in. Liked the article, informative and insightful. As you said, there is a time and place, so i guess i will just have to keep looking. With good depth analysis, and sound judgement, maybe i'll find it. ( hopefully sooner than later ) and will try and avoid swamps. Nice analysis, to an everyday poker dilemma we all face. But many times it is difficult to recognize when to fast play or slow play or who has really the nuts! The board has surprises! The situation can change to the opposite every time. Here comes necessary the study of the maths, the game and the opponents. I prefer to play fast. I slow down the game only if I have a small stack and I need to get into the prizes. I collected flash-royal against slowplay several times. But it is rather a rare exception, and you should not abandon slowplay because of this. Besides, you need to take into account the range of your opponent's hands in relation to the board. I rarely play slow because it is a sword with two blades. On micro limits, I do not recommend a slow game because they are mostly fish players and then you have to play hard and try to get the most out of this hand when we are strong because fish will always pay us on any two cards. Very nice article. Compared to articles on other sites about slow/fast playing I think its more detailed. I am not exactly sure, why is that. Is it because he isnt betting or bluffing enough for us to get value from slowplaying? So its like if we lose him by betting on the flop, probably we will lose it also at the river somehow? I like to add some thoughts. Sometimes, in low level games, you should fast play a dry flop cause he will call when connected or with face cards. But turn card could become scary for him. Lets say the board is and the turn is :Qc: river is and you flopped a set of deuces. Lets say you know your opponent range here is A10+. If you bet the flop he will call, and on the turn you may check to show weakness and to induce bluffs or to see if he connected. On the other hand, if you slow played the flop, and bet the turn you will probably lose him if the Queen didnt hit him and not get any value at all. The slow play is quite difficult when you are playing a free tournament as many players come to see the flop with any pair of cards which will have many chances that your slow play will be affected. If I know the players, which is the most important factor for me to play a slow play, I will, but otherwise due to bad experiences I almost do not play slow play. Good article! But with a strong hand on флопе it is very risky to apply such style, I love aggression. It is certainly important to have different skills, they require certain investments both moral and financial. Thank you for the article! As a "rule of thumb" I would say: "Never-ever-ever slowplay!" On the other hand, as all things in poker are relative and the only absolute truth in the game is: it depends", If you do flop the absolute nuts and there is an aggromaniac in the hand, it's ok.
mostly i like fast playing poker, sometimes it makes me problems, because i make a move without good analyzing of hand, but it's my nature, i even play chess with the same tactic)) but sometimes slow play gives great results. If you play at Poker Stars I would highly recommend against slow playing short of flopping a full house or the nut flush. Even when flopping a monster there the odds of you getting run down are more likely here than anywhere else I have played. Thank you for this post . I feel that I slow play too often and get out drawn too often . I now have some good info on when to fast play . I can't wait to implement this and see if it improves my game .